Decay is sensual in itself. 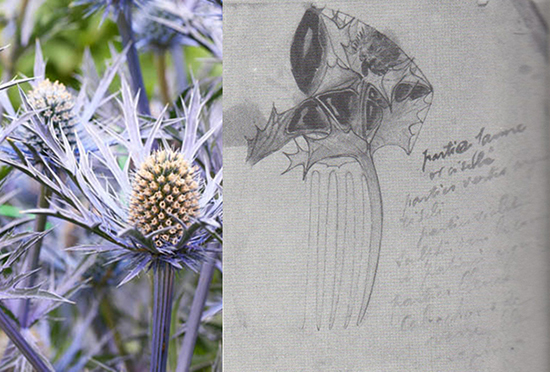 The Mediterranean Sea Holly’s cone flower turns brown in the fall, and its silvery blue bracts cannot hold water anymore. In a flower’s life cycle, death comes without tears. With a Japanese inner eye, Lalique must have noticed the sea hollies in a garden one day, as their decaying colors stood out. When he got home, he opened his drawing book. “Part yellow, chiseled gold, chiseled green-silver parts, violet parts sculpted in the horn, and patinated silver — blue parts — blue sapphire glass cabochons,” he wrote. In French Symbolism, clarity is ephemeral, but the important thing is that the artist had a vision at all. 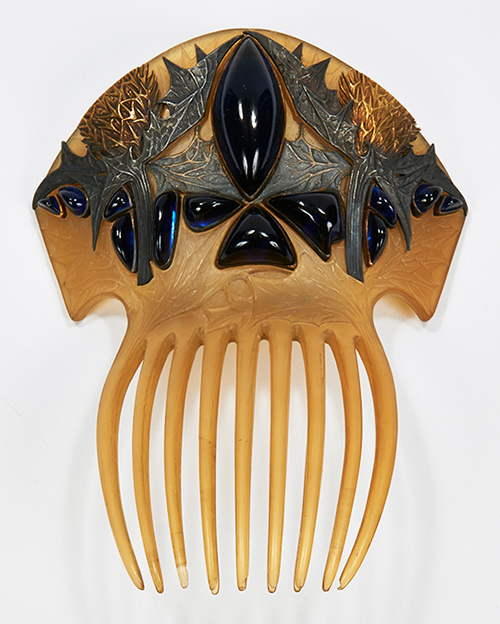 Lalique saved his vision on a comb. It is a curvilinear mirror image of two gold cone flowers with patinated silver stems and leaves. These plants frame the top of a large sapphire-colored glass cabochon. The lighter oxidized silver leaves in the middle, whose gold veins show they are not getting water, are part of a second plant. 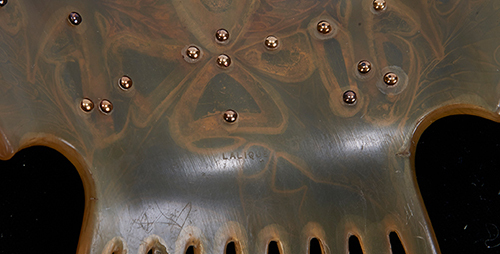 Although they frame the bottom of the cabochon, the second plant continues in delicately carved horn on the bottom of the comb, with the stems doubling as the comb’s outside tines. The signature of a hand-made Lalique piece is also correct. I did not see any silver-green or violet in this comb. Perhaps when he started working, he decided to keep those ideas in his drawing book. However, Lalique’s engineering genius is in full force here, because the silvery blue color on the leaves is achieved through the reflected light from the sapphire-colored glass cabochons. That was his original idea, and along with all the other elements of this comb, it sold at auction on 6 June 2015 for $205,000.